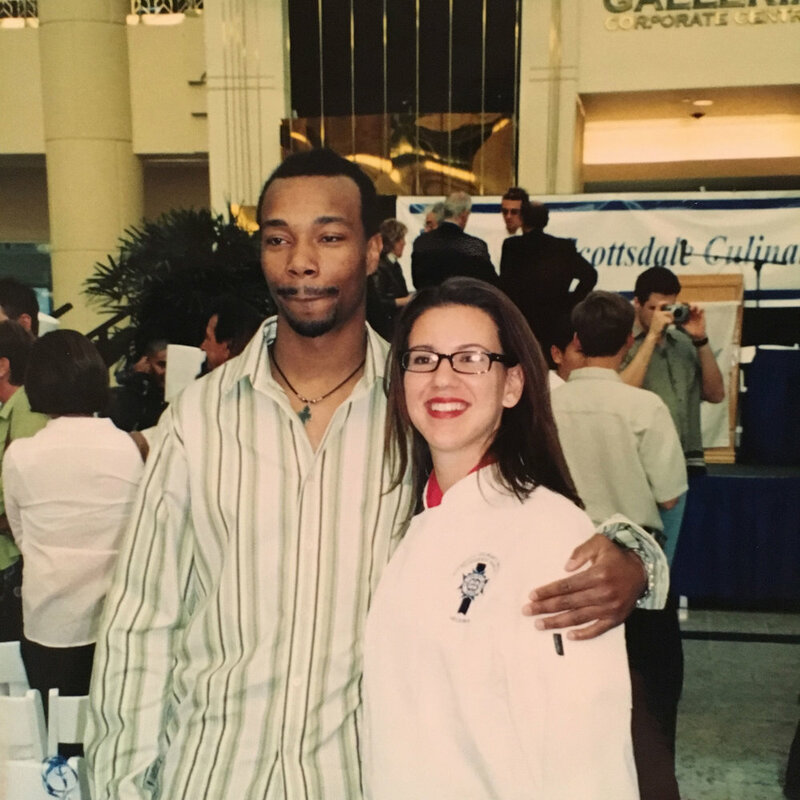 We first met our friend Shaun back in 2000 in the midst of planning our wedding, moving across the country, starting new jobs, and pretty much starting a new life for ourselves. Brian interviewed Shaun for a job while in New Jersey. He told him you can have the job, but the job is in Phoenix. Shaun was very young and had freshly finished the Art Institute of Philadelphia. He accepted the position, packed up his belongings, and off he went to Phoenix with Brian. I followed a few months later after tying up things in New Jersey. As we all started our lives in Phoenix a great friendship grew. We hung out together a lot, spent holidays with each other, and Shaun even came back to New Jersey to attend our wedding. He has helped us move into our first home and as far as I can remember he was always there for us. Shawn was also there for what I like to consider my cooking revolution, and was a taste tester for many dishes, some better than others I will admit. But he was always there, always asking me questions about how I made it, and asked me lots of advice for cooking on his own. Layering the caramelized onions in-between the brie. I know Shaun has turned into a confident cook himself, yet I know Shaun has a favorite item that I make. I frequently made it for him for special occasions like his birthday or just a dinner with the four of us. 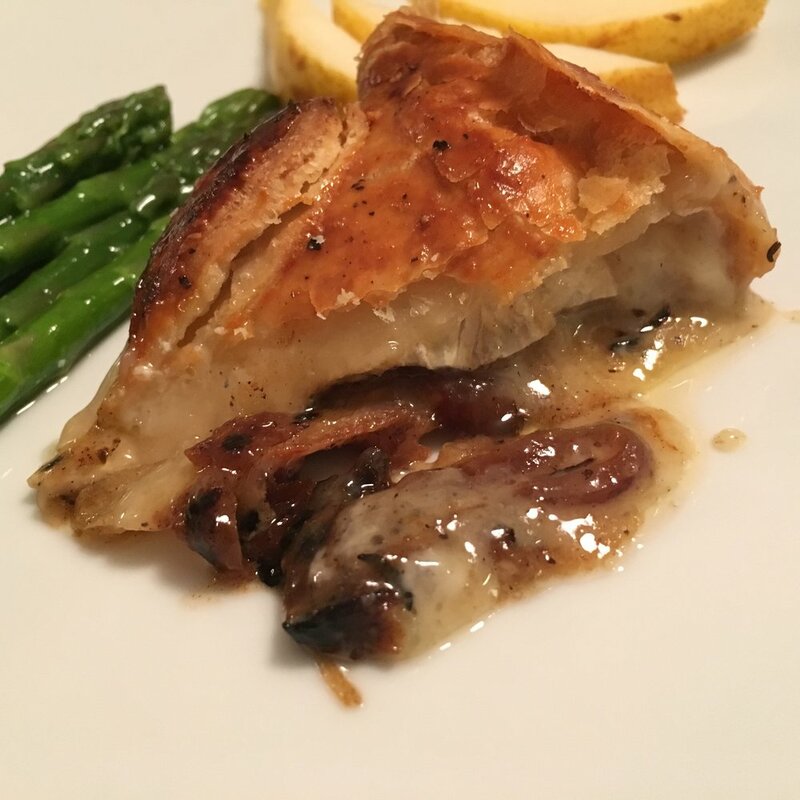 It is a baked puff pastry wrapped brie stuffed with caramelized onion. I've made it for him many times over the years, but come to think of it, I do not think I have made it since we moved to Seattle. I have been missing this recipe just like I am missing Shaun, Erika, and their girls. They have moved on from Phoenix too, now living in the Los Angeles area. I think it is time Brian and I do a road trip to visit them. I would make this Brie too if they wanted. There are many friends that come and go in life. These people are not just friends, to us they are a part of our family. I think that the only way this brie would taste better is if I had them with us to share it with. Ill keep my fingers crossed that the next time we make it we are eating it together. ***Note: You can easily make this recipe with a larger brie if you wish to feed more people. I usually double up on my finning when doing so. I have also made more than one of the smaller ones when serving a crowd. While one is out on the table, I keep the other one in the oven to stay warm and then replenish for the crowd when needed. First, be sure the package of puff pastry is well thawed out. Check the package for instructions. Meanwhile, place a heavy bottomed saute pan over medium heat. Once heated through, melt you butter and then place your onions. Keeping the pan over medium to low heat let the onions slowly simmer and caramelize. Stirring them frequently. Then, once the onions are deglazed and the liquid has reduced down remove from the heat and let cool. On a lightly floured surface, gently roll out your puff pastry dough a bit. On a cutting board carefully cut your brie width wise, place your cooled caramelized onion on the cut side of the brie. Spread the onions evenly across the brie. Place the other 1/2 of your brie over the top of it, cut side down, and gently press it all together…it should look like a sandwich. Place brie and onions on the puff pastry dough. Placing the brie in the center of the dough. Fold the dough up and over the brie, you are looking to gather it together, and brushing it with your egg wash to hold it all together. Puff pastry wrapped brie befor the oven. Finally, place the wrapped brie seam side down on a parchment lined baking sheet. Brush it all over with you egg wash. If you like you can decorate the top of your pastry with cut pieces of extra dough you cut away; or sprinkle it with a bit of sea salt, black pepper. Place in the center of the oven and bake until the puff dough has risen, and turned deeply golden in hue. Remove from the oven and let rest fifteen minutes before serving. Enjoy while still warm. Brie - stuffed, wrapped, baked, fresh out of the oven.